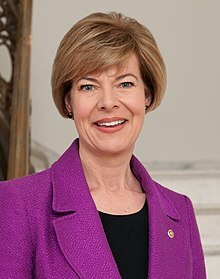 Tammy Suzanne Green Baldwin (born Tammy Suzanne Green Baldwin; February 11, 1962) is the junior United States Senator from Wisconsin and a member of the Democratic Party. She previously served as the U.S. Representative from Wisconsin's 2nd congressional district from 1999 to 2013, as well as serving three terms in the Wisconsin Assembly representing the 78th district. Baldwin was born on February 11, 1962 in Madison, Wisconsin. She is of Russian-German descent. Baldwin studied at Smith College and at the University of Wisconsin, Madison. She is the first woman elected to represent Wisconsin in the Senate, and the first openly gay U.S. Senator in history. ↑ 1.0 1.1 Baldwin, Tammy. "About". Friends of Tammy Baldwin. Retrieved June 23, 2012. This page was last changed on 29 June 2018, at 07:07.